A US army chaplain has described what he believes to be somewhat of a “revival” occurring on a military base in Missouri. The numbers are staggering: over the past six months, nearly 2 000 troops have reportedly come to the Lord. 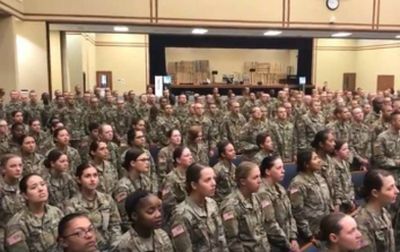 Chaplain Jose M Rondon, who is stationed at Fort Leonard Wood, has been posting about the astonishing spiritual awakening on Facebook over the past few weeks, detailing personal testimony and uploading video footage of soldiers worshipping God. “I’m excited about the future of our military for millions of our warriors who will sing God’s Amazing Grace. Glory to Christ, the only God, Saviour, and Lord in this life and the one to come,” he added. Rondon said Havens was just one example of the hordes of military personnel who have been coming to Christ in recent months. “Private Havens is just one of many of the 1 000 and almost 800 soldiers, probably 1 000 by today, we will reach around 2 000 soldiers since March 11 coming to faith in Christ Jesus and growing into their faith as is the case with Private Havens,” he noted.